U.S. President Donald Trump has proudly tweeted “I am a Tariff Man,” and brandished the tariff card in an effort to convince China to open up its market and reduce its trade surplus with the United States. However, the fiercest geoeconomic dispute between the U.S. and China is not about tariffs, but instead the contest over digital hegemony in areas such as artificial intelligence, big data, quantum computing and facial recognition technology. This was dramatically shown on Dec. 1, when Canadian authorities, acting at the request of the U.S. government, arrested Huawei CFO and Deputy Chairwoman Meng Wanzhou as she transited through the Vancouver airport on her way to Mexico. She is the daughter of Huawei’s founder and CEO, Ren Zhengei, and the “princess” of a firm that China boasts as its largest global corporation. On the day of the arrest, Trump and Chinese President Xi Jinping were holding a summit in Buenos Aires. While U.S. National Security Advisor John Bolton had received prior notice of Meng’s arrest, Trump has said he was unaware of her arrest at the time of his meeting with Xi. According to Canadian authorities, Meng violated U.S. sanctions by using dummy companies in Hong Kong as intermediaries to initiate financial dealings with Iran. Meng allegedly submitted falsified document to U.S. financial institutions — by pretending these dummy companies were not linked to Huawei — to deceive banks and evade U.S. sanctions against Iran. The U.S., meanwhile, has made broader and more serious accusations against Huawei. In late January, the FBI charged the firm with a range of crimes including bank fraud, theft of trade secrets and conspiracy to defraud the U.S. The U.S. is also concerned that if 5G is introduced widely, Huawei, which is already competitive in the field, could come to dominate the global market. The same report warned that China’s military, commercial IT companies and state R&D infrastructure comprise a “digital triangle” capable of penetrating deep into the networks of the U.S. and its allies. In 2009, Huawei entered discussions to buy out a Canadian rival, Nortel Networks Corp. However, owing to the global recession in the wake of the Lehman shock, Nortel went bankrupt. During this period, Nortel was rumored to have been subject to continuous overwhelming hacking attacks and that most of its sensitive information ended up in Huawei’s hands. It was not that the U.S. government was unable to respond. Under the administration of President George W. Bush, the National Security Agency, which possesses a cybersecurity force, implemented a secret operation known as Shotgiant. 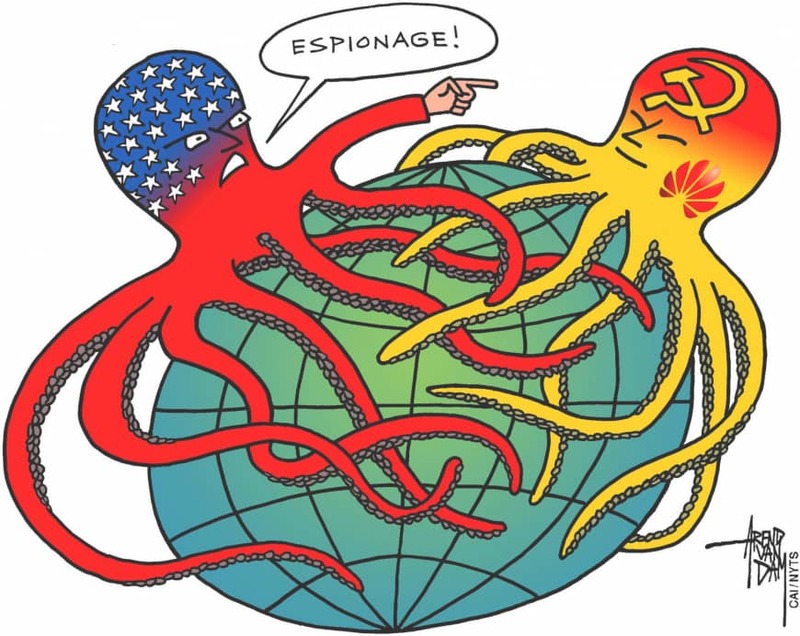 Through the operation, the NSA infiltrated the network of Huawei’s headquarters in Shenzhen, probing for weaknesses and obtaining email communications among top Huawei executives. It remains unclear as to whether they found evidence that Huawei was using spyware in its products. What is certain is that intelligence agencies around the world are deeply involved in the conflict concerning Huawei. This includes China. Enacted in 2017, China’s cybersecurity law extends national sovereignty over cyberspace and stipulates that “network operators shall provide technical support and assistance to public security organs and national security organs that are safeguarding national security and investigating criminal activities in accordance with the law” (Article 28). China also established a “national information law” that requests the support and cooperation necessary for the activities of national intelligence institutions. Chinese networks and telecommunication companies, which are represented by Huawei, are not limited to a “digital triangle” that connects companies with the military and national research institutes. In fact, they comprise a “digital quadrangle” that includes intelligence agencies. However, China’s enactment of the 2017 cybersecurity law immediately prompted countries that share secret information — the U.S., Britain, Canada, Australia and New Zealand (collectively known as the Five Eyes alliance) — between intelligence agencies to suddenly accelerate the ongoing trend of excluding Huawei products from government agencies and contractors. Among the Five Eyes members, Britain has yet to exclude Huawei. However, the chief of the Secret Intelligence Service (MI6), Alex Younger, has pushed the British government to make a decision on whether to exclude Huawei or not. He has warned that if Huawei participates in building a 5G network, it would place the British intelligence network at risk as military-related communications could be intercepted. Who will gain control of communications, information, encryption and interception in the 5G era? 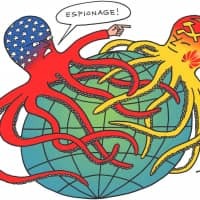 The battle concerning Huawei “spyware” is also a struggle pitting the Five Eyes alliance and other important American allies against Chinese intelligence. Yoichi Funabashi is chairman of the Asia Pacific Initiative and a former editor-in-chief of the Asahi Shimbun. This is a translation of his column in the monthly Bungei Shunju.